We welcome guests from all around the world from backpackers, to seniors,to juniors and basically anyone who is looking for a great family ambiance and relaxing place to stay.We will always try our best to make your stay as comfortable and memorable as possible. Duygu pension has spectacular bay views from the rooftop terrace and Breakfast served on the rooftop terrace with panoromic sea views. 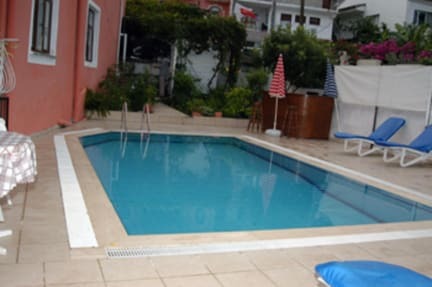 Duygu pension has a pretty swimming pool.We have a choice of rooms which include air-conditioned double rooms en-suite double,twin,triple and single rooms. [air-conditioned extra 5 euro].Visit Duygupension with your family and with your friends for an unforgatable experience and many warm memories to the back. We make all kinds of tours with special discounts. [Blue cruise fethiye olympos,diving,paragliding,12 island daily boat trip,rent a scooter,saklikent tour,ghost town and ect. 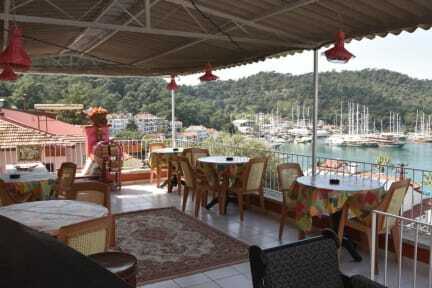 ]Car parking available [free],internet access[FREE] and laundry[6 euro].If you are looking for budget pension[guest hause]in the Fethiye area of Turkey you will come to right place.We look forward to welcoming you to our pension. FREE Clean and fresh sheets, pillow, blanket.